MUGLER woman, from the very beginning, has always been an extravagant , dynamic & eccentric being.Sébastien Peigné designer for the house's womenswear of course under the creative direction of Nicola Formichetti, the talented young stylist, creative and fashion director for several magazines, brands and pop idols(UNIQLO, MAC, Vogue Hommes Japan & Lady Gaga) successfully guarded Thierry’s vision making clothes that represent sexuality, chicness and avant-guard aesthetic with a very futuristic point of view. This year Nicola did a collection inspired by a MUGLER’s previous collection (in 1997) in which Thierry was inspired by insects. Thus the general attitude was “bug-like” with nailing nails that reminded us of insects such as beetles and dragon flies. Everything was geometrical at a point where garments looked 3D like, something that MUGLER house of fashion always adores to do. White and black with some bright orange/red touches were the colours used for the entire collection. A very futuristic collection, with mucho ninja kind of feel to it, which makes it one of the most in style brands to shop from this fall. 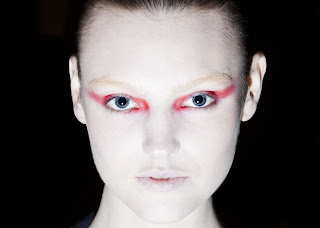 Nails, and make-up were also magique and you can easily copy the look using MAC cosmetics of course!